Nowadays, the pavements are subjected to premature failure due to rapid growth in vehicular traffic. Among various modes of failure, rutting and fatigue are the predominant ones. In addition to this, there is scarcity for good quality materials. To address these problems, the engineers are forced to design new/alternate construction materials. Geosynthetic is one among those new materials. 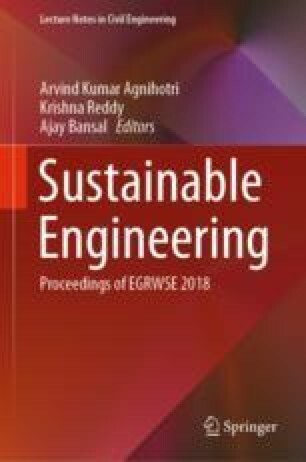 In this study, model pavement sections were built in the field under unreinforced and geosynthetic reinforced conditions. For reinforcement, uniaxial geogrid, geotextile, biaxial geogrid and geocell were considered. The reinforcement was provided at the interface of subgrade and granular sub-base course layers. The loading was done by passing a two wheeler over the pavement at an average speed of 20 kmph. Each model pavement section was subjected to 100 vehicular passes. During testing, the rut depth was measured at various locations along the length and width of the pavement at the end of 10 vehicular passes. The provision of geosynthetics was found to be effective in reducing rutting in pavements. Among various forms of geosynthetics, biaxial geogrids and geocell were found to be suitable for pavement application. With the provision of biaxial geogrid and geocell, the rut depth was found to be reduced by 28% and 56%, respectively. In addition, the provision of geosynthetics reduced the surface heaving with geocell being very effective and reduced surface heave results in improved riding quality of the pavements leading to sustainable pavements.